Catholic Social Services is now located at the Compassion Soup Kitchen. 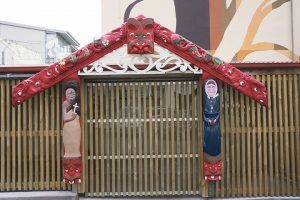 WelCom June 2017: Wellington Catholic Social Services has moved to the Compassion Centre Soup Kitchen, in Tory St, Wellington. On 27 April, Sr Margaret Anne Mills, Congregational Leader for the Sisters of Compassion, formally welcomed CSS to the building. She said the Sisters and staff of the Soup Kitchen were looking forward to working together more closely for the people of Wellington. At a blessing service the week earlier, CSS current and former staff farewelled their premises in Brougham St, next to St Joseph’s church. Also attending were the family of Hapa Ahelemo, a staff member who passed away while working as a counsellor at CSS. Hapa’s photo has been reinstalled in CSS’s new premises. Soup Kitchen manager Karen Holland said the two agencies had discussed a closer working relationship over past years, and it was a great joy to see this brought to fruition. CSS Director Lesley Hooper said the move brings the chance to work more closely with other agencies addressing issues of inner-city homelessness and poverty. Lesley said the restructuring that has brought hospital and prison chaplains, the clergy care coordinator and the Justice Peace Development advisor under the umbrella of the Vicariate of Catholic social services, has expanded the vision and the reach of the agency. The Wellington Catholic Social Services office is on level two of the Compassion Centre, 132 Tory St, Wellington. Please contact CSS on phone (04) 385-8642 or email reception@wn-catholicsocialservices.org.nz to talk to someone about a counselling or social-work appointment. 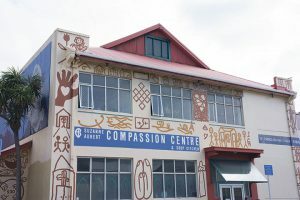 Wellingtonians gave generously to the Compassion Soup Kitchen in May 2017. The Compassion Soup Kitchen staff and the Sisters of Compassion thank to everyone who donated through their ‘Soup Kitchen for a Day’ schools’ programme and to their Street Appeal. Donations enable their work to continue supporting people in need to live with dignity in the community.